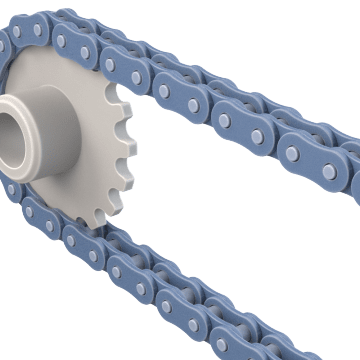 These chains have a single row of links that mesh with teeth on a compatible sprocket to transmit power between drive shafts in a chain drive system. Unlike belts, chains will not slip or creep, and they can operate in wet, dirty, or corrosive environments. Use chains with sprockets that have the same ANSI number. Durable general-purpose roller chains are a good choice for conveying equipment, machinery, or similar applications. 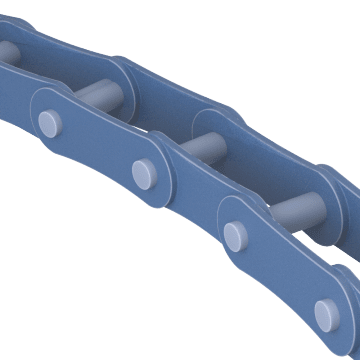 Ideal for applications with heavy loads or shock loads where space is limited, these chains are the same size as general-purpose chains with the same pitch, but they have thicker side plates for increased strength. Made from corrosion-resistant materials, these chains resist rusting or degrading in wet or corrosive conditions. 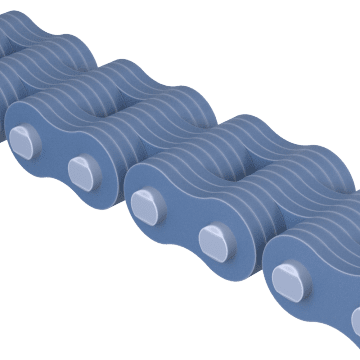 Featuring extra-long plates, these double-pitch roller chains have half as many pins and rollers as comparable standard roller chains and are an economical solution for applications with light loads, low to moderate speeds, and long drives. Choose these self-lubricating chains for applications where lubricants cannot be used, such as in facilities where lubricants may attract abrasive dirt and debris that would damage the chain. They typically require less maintenance than chains that require lubrication. Also known as side-bow chains, use these chains on systems with curved tracks or misaligned sprockets. They have extra space between the chain components that allows the chains to flex side to side. 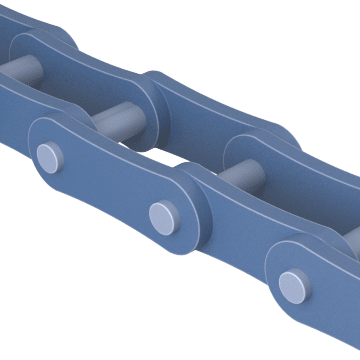 Sturdy leaf chains, also known as counterbalance chains, provide more tensile strength than roller chains. 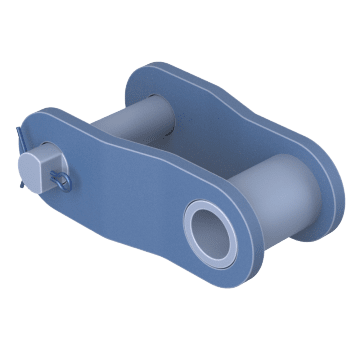 They are well suited for low-speed pulling and lifting applications and can be used as counterweight chains for machine tools, fork lift masts, elevator doors, and other equipment. 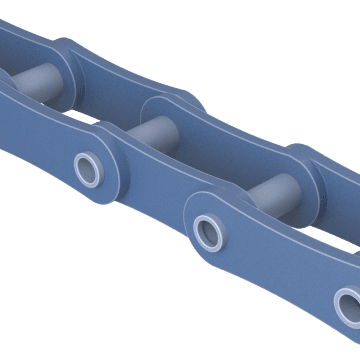 Consisting of interlaced plates connected with rivet pins, leaf chain should be installed on flat pulleys, not sprockets. When worn or damaged, the whole chain must be replaced. Join the ends of a length of chain using these individual connecting links, also known as master links. They have a removable side plate that lets you install the chain ends onto the link quickly. 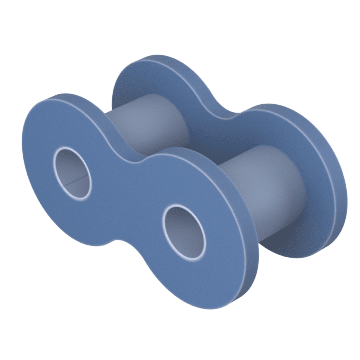 Make a chain with an odd number of pitches or shorten a chain by a single pitch with these offset links, also known as half links, crank links, and add-and-connect links. They have a removable side plate that lets you install the chain ends onto the link quickly. 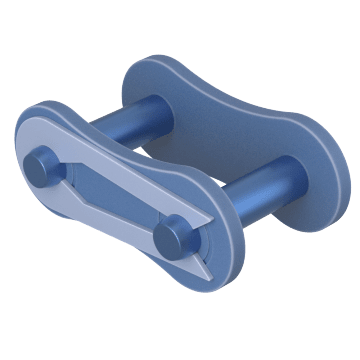 Sometimes called adding links, use these individual roller links to replace worn or damaged links on roller chains. They require two connecting links to be joined to a chain.